Both of us had been through grief, having lost our believing spouses. After those difficult periods, both of us were determined not to sit on the sidelines as armchair Christians. We had been friends for a long time and became best friends. We both wanted to be active, in the mission field where doors opened, and speaking into people’s lives. Neither of us expected to be married to each other and were headed to two different continents. We thought. The unusual circumstances that God used to put us together was quite a surprise, but our goals were the same. In our planning for the wedding, we believed the marriage ceremony demanded a small assembly of larger witnesses who we invited for one primary purpose: pray for us. Among those who prayed a year and a half ago were two special people. Beth and Mama were prayer warriors. Mama prays for her Chinese church and individuals. She always has since I first worked with that group of believers. She laid hands on my late wife and me more than once while fervently talked to God about things we could only guess. She prayed for my late wife as the time drew close to her death. She never stopped praying for me. When I returned from my trip alone to the Philippines, I knew she was part of the change in me to return to live there most of my life. When Faylene and I were “thrown” together, there was no doubt in my mind that we wanted her to pray for us. She is the one standing over us. I asked her if she wanted a translator a little before the wedding. She was polite but firm, saying, “I don’t need one; I will be talking to God.” That’s Mama. Beth was at the little church where we were married. I have friends there. I love the pastor. My other best friend goes there, and he has prayed over the years for me. However, Beth is special. 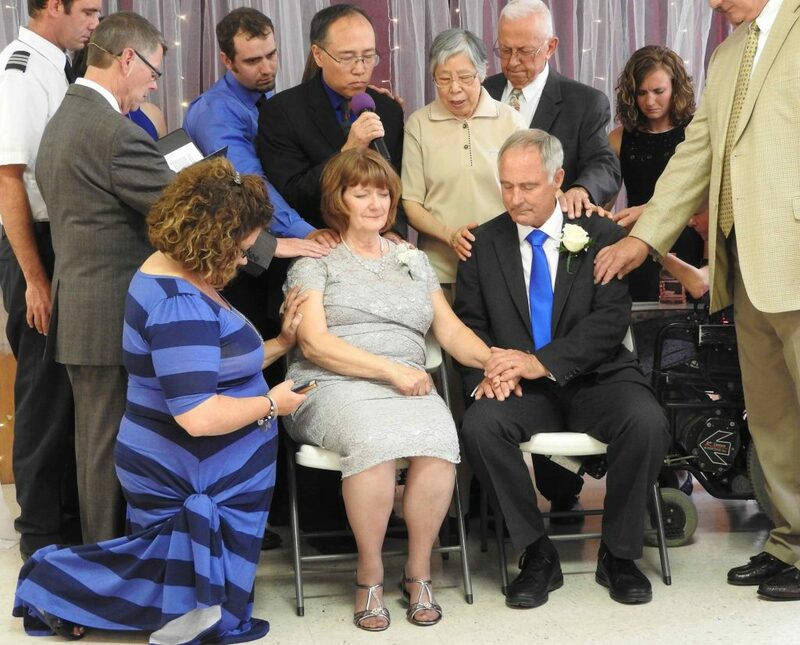 Because of injury and spinal damage, every part of life for her was difficult, but she prayed. Year after year, pain episode after pain episode, she never stopped. As we became friends, she prayed for my late wife, too. She prayed for the ongoing work in the Philippines. She prayed for me during my grief. She prayed as things changed, when I knew I would return alone to serve there most years. She prayed for Faylene and me. Her condition was worsening and it was hard. She kept praying–quietly and in the background. You can barely see her in the wheel chair on the far right and in back of other people. Can you see? There was no question that we wanted her to pray for us, yet she was not sure she would physically be able to make it. She came. That’s Beth. Beth went home to the Lord a few weeks ago. Who has your back? Who covers you when you feel like you are hung out on a limb? I have a few friends that pray for us and we are most grateful to God for their prayers. They go with us every time we go overseas, though most will never be able to go. So, led of Spirit, they pray to the Most High, the One who empowers us, but also the One who uses special people to hold us up. Beth and Mama are two really fine examples. Pray to the God of the Bible. He knows. He remembers. Tagged Bible, friendship, inspiration, Philippines, prayer, wedding.